The capital of Saudi Arabia is Riyadh. The Red Sea port of Jeddah, Taif, which is the summer capital and the industrial cities of Jubail and Yanbu are also important cities. Saudi Arabia’s most important cities are Mecca, birthplace of the Prophet Mohammed and Medina, to which the Prophet moved in 622 AD. These are the two holiest cities of Islam. Most of Saudi Arabia is desert. The central region consists of an eroded plateau, mostly arid and hot in the summer and cold in the winter. The western region is mountainous, except for the coastal plain bordering the Red Sea. The southern region is also mountainous and receives enough rainfall to support agriculture. Finally, the eastern part of Saudi Arabia is flat and sandy, bordering on the Arabian Gulf and possessing most of the country’s vast oil resources. The modern cities of Riyadh and Jeddah include dramatic buildings by the world’s leading architects. Saudi Arabia’s own architects are now using elements of traditional design in new structures as part of the country’s commitment to the revitalizing and preservation of its national heritage. 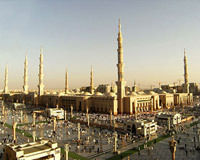 The population of Saudi Arabia was estimated at 28,161,417 in 2008. The population also includes many expatriate workers from all over the world, attracted by the needs of the oil industry.